Spray a sheet of foil paper with cooking spray and place salmon skin side down. Repeat with 3 remaining salmon fillets. Spray salmon tops with cooking spray and season with salt, pepper and cumin. Distribute lime, jalapeño and onion equally between each foil package. To create the papillote, fold opposite sides of foil toward each other (as you would close up an empanada), and make sure all is properly sealed. Place salmon packages on baking sheet. Bake for 15-20 minutes until or salmon is fully cooked. Serve warm. Mix it up – Swap lemon for limes or oranges. Don't like it spicy? Omit the jalapeños and use olives. 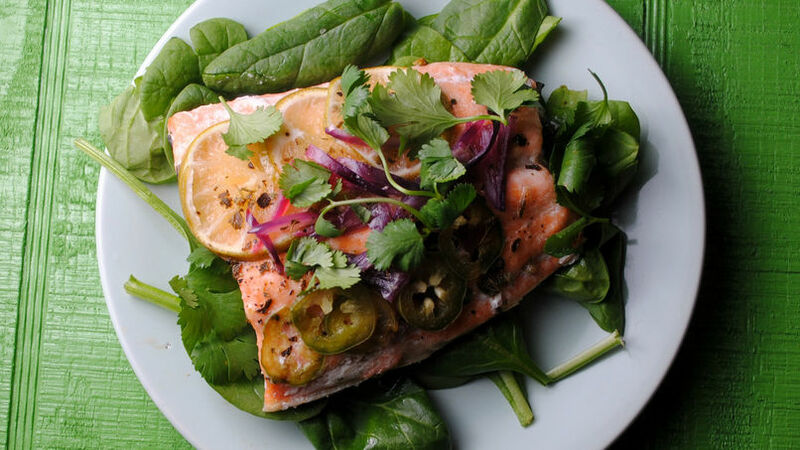 Baking salmon in a foil package, or en papillote, ensures that your fish is moist, tender and flavorful. I for one like to boost my salmon with a layer of sliced limes and jalapeños. Served warm over a bed of spinach or rice, this easy to make meal will make everyone at the dinner table happy.